Our blog has moved and you can now find all of our new and future blogs on our website. We will continue to share our stories, events, and other interesting items on our new blog and hope that you find them enjoyable or informative - maybe even share them with your friends and family too! We thank all of our loyal blog readers, and hope that you will join us on our new blog. Almost 100 felines hope to find their forever families this weekend, as the RSPCA Sydney Shelter in Yagoona waives feline adoption fees for three days only. The shelter is struggling to cope with the number of felines in care after an especially busy kitten season . So far since kitten season began in September, 167 cats and 637 kittens have been rehomed by the Sydney Shelter alone. “While there are 91 cats currently at the shelter, there are another 187 kittens in foster care and more come through our doors every day,” Sydney Shelter Manager Donna Hough said. All standard adoption processes will take place to ensure the cat is the right match for the new home. Information is provided about health care and new adopters have access to staff support with any questions over the coming weeks. For more information about just some of the many cats currently available for adoption, visit Adoptapet.com.au. 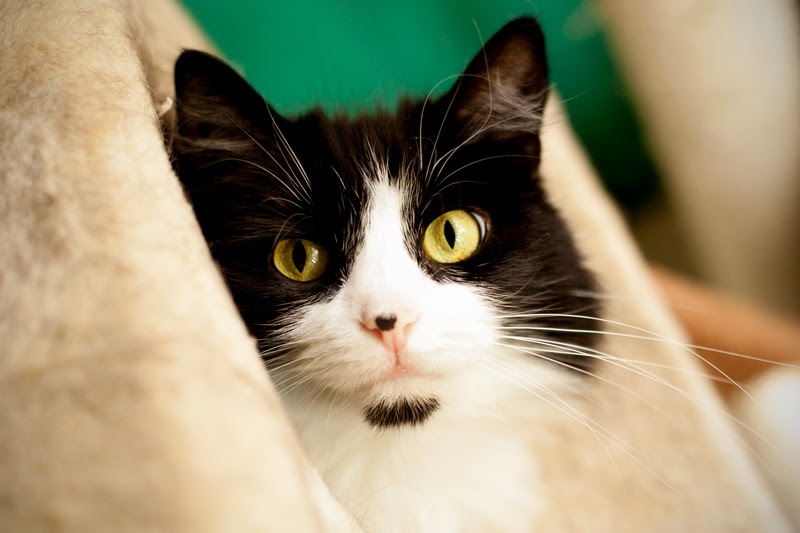 All RSPCA cats are desexed, vaccinated, microchipped, flea-treated and wormed. Please see our FAQ's below for further information or contact us. Are these all the cats in the shelter, or are there some 100% healthy or pedigree ones that are being kept aside? These are all the Adoption ready cats. There are no cats being kept aside, there are currently 59 adult cats and 30 kittens available to be adopted at the shelter. There are no extra charges for defined breed/pedigree cats in our shelters. Is this across the state or just at the RSPCA Sydney Shelter? Our Sydney Shelter is nearing catpacity (excuse the pun! ), so we are only running this at the Sydney Shelter (201 Rookwood Rd Yagoona). While it is only being run in Sydney, this in turn will provide the Sydney shelter with an opportunity to assist other facilities by accepting more cats in. Are the cats desexed and vet-checked? All cats adopted through RSPCA are vet checked, microchipped, vaccinated and desexed. If you are giving them away for free, how do you know it’s the right home? What is the adoption process? All normal adoption processes will take place. Animal Attendants will ensure that the cat is the right match for the new home, e.g. a particular cat may not be suited to go to a home with children as it prefers a quiet mature household. An Animal attendant will provide the interested adopter with details about that particular feline, including what treatments (parasite control, microchipping, desexing etc) it has received and what regular treatments will be required, including the dates they are due (flea, intestinal worming, vaccinations). They will discuss the diet the feline has been on. Ideas on how to best introduce the new cat to your existing human and pet family and any other questions the adopter has. The adopter will go home with an animal health check card with the date of parasite control, vaccination and desexing stitch removal (if needed). As well as a Cat adoption booklet which answers common questions about cat care, the RSPCA is able to provide over the phone support if required once the animal has gone to the new home and the owners have a question or concern. Are they all actually sick or have they just been exposed to cat flu/calici/something else? Some are healthy; some are recovered from cat flu or calici; others are currently being treated for cat flu/calici. If any cat has an ongoing medical condition, our animal attendants or vets will speak with you before adoption. Are they recovered or do some still need medication and extra TLC? There are no cats being kept aside, there are currently 59 adult cats and 30 kittens available to be adopted at the shelter. There are no extra charges for defined breed/pedigree cats in our shelters. How many cats and kittens have you rehomed recently? In the last six months, we have rehomed 167 cats and 637 kittens from the Sydney Shelter. With another 197 cats and 205 kittens from Petbarns in Sydney. That’s 1,206 felines that have families, but more need to find there forever families. How many cats and kittens do you have in foster? 13 cats, 187 kittens and there are currently a couple of cats/kittens awaiting foster at the shelter. I can’t adopt a cat, what can I do to help? Dog owners in the Hunter region are being urged to ensure their pets are up-to-date with their parvovirus vaccinations with a spike in cases. “We are seeing dogs fall ill across a large area at the moment,” RSPCA Hunter Vet Manager Dr Simone Cooper said. “Dogs have fallen ill in the Lake Macquarie region as well as Rutherford, Maitland, Singleton, Cesssnock and Kurri,” Dr Cooper said. “We've even seen dogs die from four homes in the same street in Weston, the situation is incredibly serious and a major concerns with the weather set to stay warm and see the virus thrive,” she said. Parvovirus (often referred to as parvo), is a viral infection that affects young puppies and unvaccinated adult dogs. The disease is incredibly hardy, and can survive up to a year in the environment. It’s highly contagious and can be contracted through direct or indirect contact with infected dog faeces. “Even if dogs don’t come in direct contact with an infected dog, they can still contract the virus through contaminated objects such as shoes, clothes, even the ground,” Dr Cooper said. Once infected, dogs typically start to show signs within seven to ten days. Symptoms may include loss of appetite, lethargy, vomiting and profuse, bloody diarrhoea which can quickly lead to dehydration. If left untreated, severe shock and subsequent death can occur within a 24-hour period. The only way to protect your dog against this deadly disease is through preventive vaccination. Puppies are first vaccinated at six to eight weeks of age, with a booster two to four weeks later. Dogs then need another booster every year. “People cannot underestimate the potency and prevalence of this virus right now. If in any doubt about your pets’ vaccination history, speak to your vet immediately,” Dr Cooper concluded. Our vet services can help you protect your dog. Contact us on 02 9770 7555 for more information. St Patricks' Day is an Irish cultural and religious celebration held annually on the 17th March. Although originating in Ireland, it has since become recognized world-wide, with many people embracing the event by wearing green and decorating with shamrocks. In celebration of St Patrick's Day, RSPCA NSW is highlighting our current Irish Wolfhounds, and why they make such great pets! The Irish Wolfhound is of ancient origins and in Ireland, these dogs were favoured by Irish Chiefs for hunting wolves and Irish elk. Irish Wolfhounds are known to be big-hearted, gentle, and sensitive creatures, but their size is an important consideration, in fact Irish Wolfhounds are the tallest breed of dog! Like all sighthounds, the Irish Wolfhound is known to love chasing and running, but they are generally model citizens with other dogs, pets and children. Their great size can be intimidating, but due to their gentle nature, are generally not known to be good guard dogs. Learn more about the Irish Wolfhound! On 18th of December 2013, the RSPCA received a complaint in relation to a dog taken to Blacktown Council Pound. Witnesses described the dog as being skin and bones, missing large amounts of hair and having scabs, pus and sores over its body. The Pound staff advised the man with the dog, that the animal required urgent veterinary treatment. Witness accounts state the man became agitated and left the pound after staff questioned him about the dog’s poor condition. One witness approached the defendant in the car park where he agreed to give her the dog. The woman immediately took the dog to a local vet who assessed the dog as being very underweight with a body score of 1/5, where 1 is emaciated and 5 is ideal. The dog had no discernible fat and was experiencing severe muscle wastage, he had a heavy flea burden and severe areas of hair loss associated with severe thickening caused by rubbing, scratching and crusting. These conditions would have been present one month prior to presentation. After taking witness statements from the woman and pound staff members, the RSPCA Inspector then spoke to the man on the 13th of February, 2014. During the interview the defendant said he’d gone away for a week and returned to find the dog in that condition. He said he believed it was from a spider or insect bite. The dog was reportedly in the care of his parents while he was away. The man stated his parents told him there was something wrong with the dog. He said he took her to the pound a week after he returned. The man said the dog’s appetite had notably declined and that he didn’t think his dog’s condition was normal, but couldn’t afford vet or medical care. He acknowledged the dog would have been in discomfort. The RSPCA Inspector took photographs taken of the dog (by witnesses on the 17th of December, 2013) to a veterinary skin specialist for assessment. The report noted the dog to have a skin disease which was characterized by extensive hair loss with skin thickening and increased pigmentation affecting over 70% of the body surface area and would have been present for at least three months prior to presentation and more likely for six months or more. The generalised disease and poor body condition was not consistent with an initial localised insult or trauma, including a spider bite. 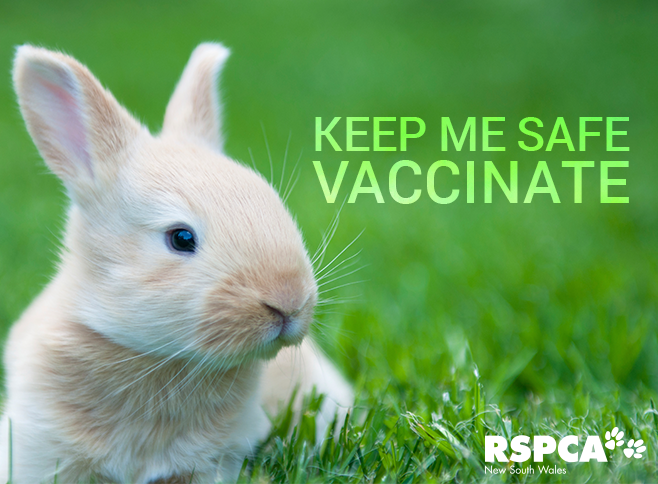 Owners of domestic rabbits are urged to ensure their pets are fully vaccinated against the deadly Calicivirus before 28th February 2015. The Calicivirus baits are set to be laid in late March, weather permitting. The warning comes as many councils across Sydney prepare to release the virus in a bid to tackle the ongoing feral rabbit population in the area. The virus is highly contagious and spread by rabbit-to-rabbit contact and by biting insects, causing a rapid death for rabbits. “The best form of protection is a yearly vaccination,” said RSPCA NSW Chief Veterinarian Magdoline Awad. “Rabbits should also be housed in a mosquito-proof enclosure away from contact with wild rabbits,” Dr Awad said. “The virus only affects rabbits and causes a disease known as Rabbit Haemorrhagic Disease or RHD. The virus works by infecting a number of organs including the lungs, gut and liver of the rabbit. The liver infection causes acute hepatitis that can kill the rabbit within 48 hours,” Dr Award said. There is a vaccine available from your vet to protect your pet rabbit from this virus. The vaccine is given once to rabbits over 12 weeks of age. For younger rabbits, the first vaccine requires a booster. All rabbits require yearly boosters. Contact us to get your rabbit vaccinated. All RSPCA rabbits are vaccinated for calicivirus, desexed and microchipped prior to adoption. Council areas to be impacted are; Hills Shire Council, Hornsby Shire Council, Hunters Hill Council, Ku-ring-gai Municipal Council, Lane Cove Council, Manly Council, Mosman Council, North Sydney Council, Parramatta Council, Pittwater Council, Ryde City Council, Warringah Council, Willoughby City Council. A 33-year-old woman has been fined $750 and banned from owning animals for two years after appearing in Mount Druitt Local Court on Thursday, the 19th of February, 2015 and pleading guilty to two counts failing to provide veterinary treatment to her female Great Dane dog resulting in its death. On 27th July 2014, a complaint was received by RSPCA NSW alleging that a dog was dead in a backyard in Bidwill. On arrival, a four-year-old black and grey female Great Dane was seen laying unresponsive in the rear yard. There was no one home at the time. The dog was noted to be in an emaciated body condition with its ribs, spine and hipbones clearly prominent. NSW Police assisted in seizing the deceased dog and the RSPCA transported it to the RSPCA Sydney Shelter in Yagoona where a post mortem was conducted. An RSPCA Veterinarian noted the dog weighed 21kg and had all bone prominences easily visible from a distance. Based on the Tufts Animal Care and Condition Scales for assessing body condition, where 1 is an ideal body condition and 5 is the most underweight, this dog was given a body condition score of 5. Further observations noted severe generalised muscle and fat atrophy, with the rib, bony prominences of the scapula, spine and hips easily visualised and palpated. A large amount of flea dirt was also found alongside live fleas. It was estimated the dog had needed treatment for fleas for no less than two weeks but likely longer. The vet assessed that the dog would have required a veterinary examination for its emaciated body condition and necessary treatment for a period of no less than 4 weeks prior to its death. Two RSPCA Inspectors returned to the residence where the dog was found to interview the woman on the 4th August, 2014. The woman said she owned the female Great Dane for around four years and was in charge of her daily care. The woman said she was aware that the dog needed treatment for worms and that the dog hadn't seen a vet for a year or two. The woman said though she usually lived at the residence, she had been staying elsewhere, returning home sporadically to give her two dogs food and water. She admitted knowing her two dogs fought over food, and the male dog dominated, leaving the Great Dane to starve, and she did nothing to intervene. The accused last attended her home on 27th July 2014, not returning until some four days later. She failed to have anyone else check on the animals or feed them in her absence. The woman said she last saw the dog alive on the 27th of July, stating “she was on the...she was on like the… the slender side,” describing her body condition as “Um, like her back bone a little bit was...a little bit was showing and her haunches,” and acknowledging that the dog did not look normal or healthy. For media enquiries, please contact Jessica Conway on 0488 905 353. The RSPCA - The Royal Society for the Prevention of Cruelty to Animals - is Australia's pre-eminent animal welfare organisation. We provide a strong voice for animals experiencing cruelty and neglect. The RSPCA is not a government agency and receives only a very small amount of funding from the Government. We rely on the generosity of the community and our own fundraising initiatives to fund our vital work.